Agent Savills is guiding a price of €420,000 for Unit 12, Eastgate Drive at Cork's Eastgate Business Park. 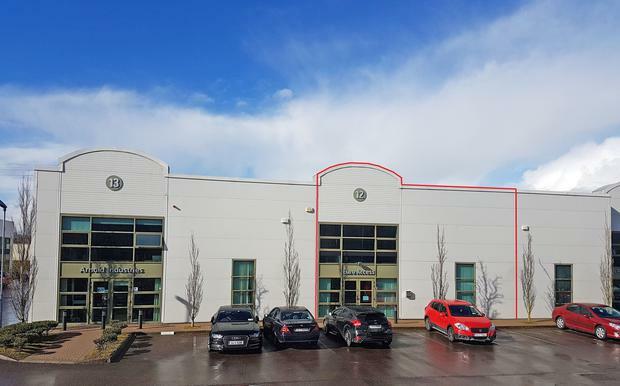 The property, which is also available to let, is a mid-terraced light industrial/commercial unit located to the south-western end of the business park. Unit 12 extends to 4,211 sq ft with an additional mezzanine level of approximately 677 sq ft. The property comprises fully-fitted office space on the ground floor arranged as cellular offices, a boardroom, toilets and kitchenette. There is additional open-plan office space and a kitchenette located on the unit's mezzanine level. There is ample car parking to the front of the property and a loading/unloading area for HGV vehicles to the rear. Developed by O'Flynn Construction, Eastgate Business Park is located 1.5km east of the Jack Lynch Tunnel, adjacent to the main interchange of the M8 Cork/Dublin road and the N25 Cork/Rosslare Euro Route. The park has a wide array of office, commercial and retail occupiers which include Eli Lilly, Laya Healthcare, ESB International, UPS, Anderco, The Range and EZ Living. Emmet Finnegan and Niall Guerin in Savills' Cork office are handling the sale.